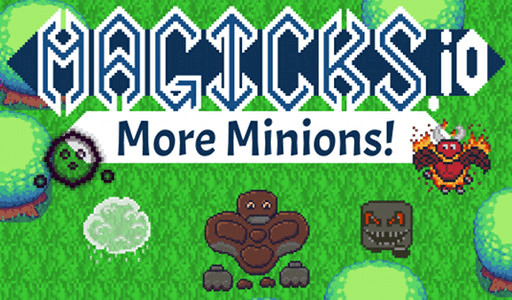 Magicks.io | Play Magicks.io free on iogames.space! Enter a dynamic and evolving world of magic and adventure in this ambitious pseudo MMO about wizards, where you can join with, or fight against, fellow mages to learn and master the arcane arts. A simple yet deep elemental counter system where each of the 7 elements have their own distinct playstyle, strengths and counters. Many unique spells to discover and experiment with. Summon a horde of minions with Dark, defend yourself with Earth, trick your enemies with Psychic, and many more. Shape the world around you and manipulate the environment to help your allies and crush your foes. Create an Order of wizards to claim a zone and work together to build a mighty base. Trade your spare spell scrolls with other players to find the spells you don't have yet. Play with your friends across desktop and mobile. Combine elements to form spells. You start with one spell in each element. Learn more spells by casting existing ones. When you get enough XP in that element, you get a spell scroll to use. It's no longer here anymore. Yeah, the game has been shut down. It just wasn't ready. I'm working on another game for now though. Maybe Magicks will return in the future.